Wigtown and Bladnoch recorded a comfortable 6-0 league victory over bottom side Dumfries YMCA last Saturday and were five goals to the good before the break. Alex McColm opened the scoring in the 16th minute with Lewis McIntyre adding a second four minutes later. Blair Dougan, Reece Agnew and Robert Jamieson found the net before the interval with Jamieson hitting YMCA for six after the re-start with 13 minutes left to play. Fleet Star scored three without reply against Nithsdale Wanderers at Gatehouse while second placed Edusport Academy beat Lochar Thistle 4-1 at Maxwelltown High School. There were also three cup ties played last weekend in a variety of competitions with a young Queen of the South side going through to round four of this season’s most prestigious competition the Challenge Cup when they beat Creetown 3-1 at Castle Cary Park. Andy White broke the deadlock in the 17th minute with Mids keeper Peter Crolla denying the visitors on more than one occasion. In an end to end match Mids left it late to wrap up victory with Nathan Muir setting up Connor Murray with six minutes left to play and Andy White ensuring a cup final place two minutes from time. Heston Rovers also reached a cup final when they saw off the challenge of local rivals Crichton at Palmerstone Park in the semi-final of the Cree Lodge Cup. 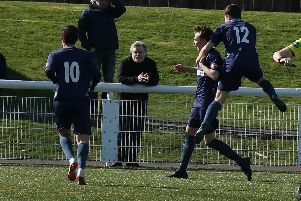 Tom Smith scored after 17 minutes play to give the home side a slender half-time lead and goals from Ross Newlands and Ally Queen in the second half saw Heston fire themselves into the final of this particular competition.